Lt. Gov. John Fetterman to embark on pot tour of Pa.
Gov. Tom Wolf, left, and Lieutenant Gov. John Fetterman, right, both Democrats, announce plans for a statewide listening tour aimed at gauging the public's interest on legalizing recreational marijuana. The two appeared together at a press conference in the state Capitol on Thursday, Jan. 24, 2019. HARRISBURG — Democratic Lt. Gov. John Fetterman on Thursday announced plans to hold a forum in every county in the state to test public opinion on legalizing recreational marijuana. The tour comes as an increasing number of states are either legalizing various forms of marijuana — 10 states and the District of Columbia allow recreational use — or inching toward such measures. Some have cited the potential to tax it and bring in extra money for various programs, while others have touted it as a way to chip away at mass incarceration. Polls conducted by Franklin and Marshall College show the percentage of Pennsylvania voters who support legalizing marijuana has more than doubled in recent years — jumping from 22 percent in 2006 to 59 percent in 2017. Still, legalization would be a tough sell in the Republican-controlled legislature, where some have already expressed emphatic opposition. The listening tour comes almost three years after the state passed a law authorizing the use of medical marijuana to treat some ailments, following a years-long battle in the legislature. It remains illegal under federal law. 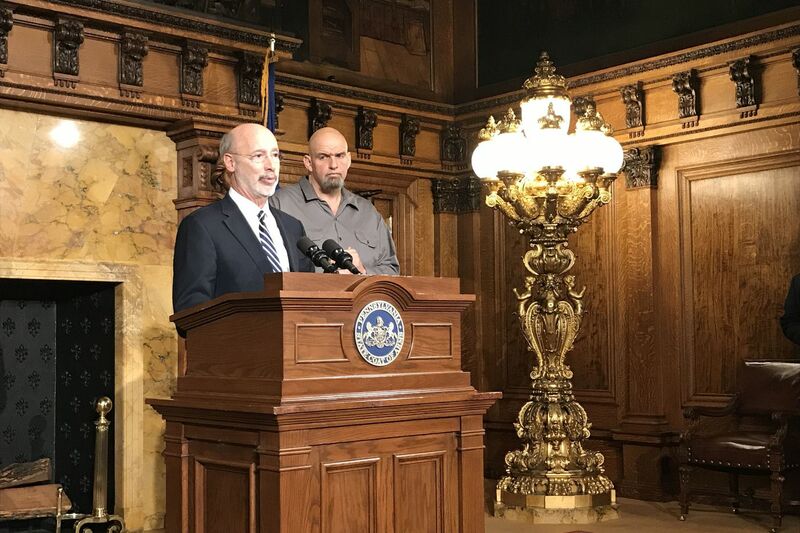 Fetterman and Wolf made their announcement on the day Center City Philadelphia got its first medical marijuana dispensary. The Wolf administration did not respond to inquiries about whether the governor or Fetterman had ever personally used marijuana. Republicans in both the state House and Senate said they intend to focus their efforts on ensuring that the state’s medical marijuana program is properly used. House Republicans, who control the legislative schedule there, said they are open to the discussion about recreational use but don’t view it as a priority. “Legalizing drugs in any form right now is not on the top of anybody’s agenda in our caucus,” spokesperson Mike Straub said. New Jersey has progressed well beyond the listening phase in legalizing recreational pot, a priority of Gov. Phil Murphy, a Democrat. The judiciary committees in both houses of the Legislature last November passed bills to allow adults to possess and use an ounce or less of the drug. Murphy and legislative leaders are hashing out the details of what final legislation should look like. In New York, Gov. Andrew Cuomo, also a Democrat, has pledged to push for marijuana legalization this year. Corman’s remarks come as Pennsylvania is trying to curb the effects of a heroin and opioid epidemic that has ranked as one of the deadliest in the nation. The Wolf administration has in recent months conducted a different listening tour to meet with families who have lost people to opioid overdoses.